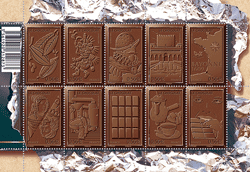 Meanwhile last May, France tried to out-do Switzerland’s 2001 chocolate issue by releasing an entire 10-stamp candy bar. As they say at La Poste, Le bloc est imprégné d’une senteur chocolat. 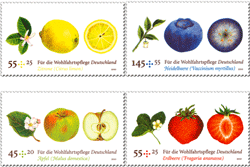 German fruit and French chocolate? What’s wrong with the old cultural stereotypes? I’d love to smell a hoppy Oktoberfest commemorative or an airmail stamp celebrating the buttery baked croissant. As for the money-losing U.S. Postal Service—they just missed a huge opportunity. Imagine a 75th birthday stamp for Elvis that smelled like a fried peanut butter, banana and bacon sandwich. Ummmm . . . bacon.